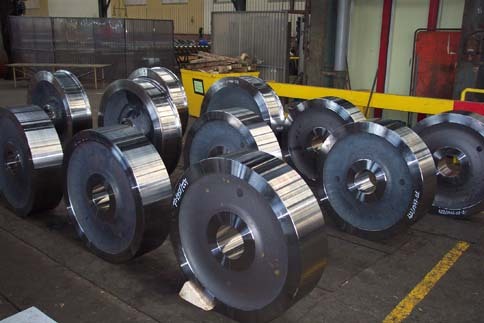 Industrial Wheel forgings are available in a wide range of standard sizes. In addition, industrial wheel forgings to meet your special design requirements can be produced in virtually any size, configuration and surface finish condition. We maintain a large inventory of carbon and alloy steels to meet your specific requirements. Industrial wheel Forgings include a wide variety of single flanged rail wheels which are used in many applications. Hot metal transfer cars, molten iron 'torpedo' cars, ladle rotate cars and mine cars are all examples of heavy duty applications. Industrial Wheel Forgings are available in any surface hardness up to 60 Rc including our standard heat treatments.